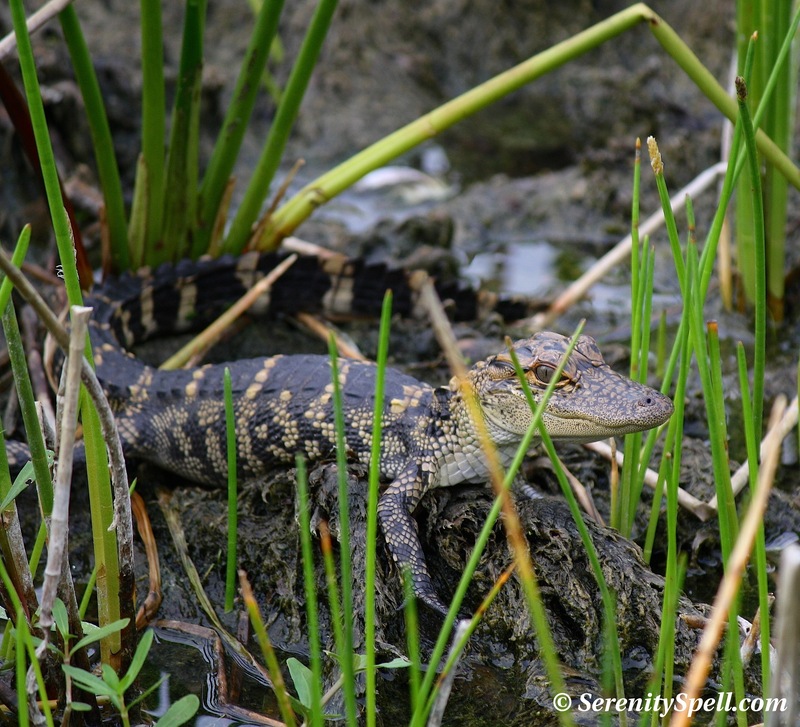 Growing Gator Baby — A Survivor! I was lucky to have witnessed a mating pair of alligators during a recent trip to our protected wetlands — while I believe the actual mating had already occurred (as evidenced by the babies on the nearby bank), their affinity for each other was obvious; Alligator Love: A Courtship offers opportune images of alligators’ elaborate courtship. Nearby were their offspring (8-9 counted) — as captured in Alligator Babies. This little guy has grown quickly in the last 2-3 weeks; I didn’t spy any other siblings, but hopefully some have managed to survive the rigors of the swamp. After laying 20-50 eggs, the mother alligator closely guards her hatchlings — at 6-8 inches long, they’re near-replicas of the parents, save for a series of yellow and black stripes which camouflage beautifully with the surrounding marsh roots (the rings aren’t as pronounced in this more recent picture). They remain with her for five months before finding their own ways. We typically see 5-10 hatchlings survive in our protected wetlands — and even less make it to this age, as shown below. Common predators that prey upon the juvenile alligators include snapping turtles, snakes, raccoons, bobcats, raptors, and even larger male alligators. Look at that face; I hope the little guy makes it…. What an adorable baby…. though they frighten me so as adults! I think it is wonderful that you interact with nature in this way. My backyard is a sanctuary, but of a different sort, as we live in Texas. I love sitting out there until I blend in with the surroundings and the animals feel comfortable to go on about their merriment. That’s SO wonderful… I’m firmly of the belief that we’re all here together, and so much of the natural world has been obliterated with non-natural entities — concrete and the like. I do think the tide’s turning, but any tiny way we can appreciate it and return it to the natural order… THE BETTER! 🙂 I would love to live near a sanctuary — you’re so very lucky. For now, it’s a quick drive. But I’m lucky enough to live on a little lake with lots of wading birds, so I can’t complain. CUTE UNTIL THEY HUGE!!! THEN JUST GOOD LOOKING BUT A BIT FRIGHTENING! 🙂 True… They’re the ultimate predator! But I figure after 20 million years here — nearly becoming extinct, stupidly and vainly at our hands — they deserve the leeway! And believe me, I’m more than willing to give it to them, hahah! how very kind of you… THANKS for the kind words and vote of confidence! and it’s a sunflower, wouldn’t you know — i was just going to buy some sunflowers yesterday. i opted for smaller daises, easier native ground cover. they’re in honor of some stray kittens we recently lost, and buried near a tree. daisies and innocence… but sunflowers are so bright, i couldn’t resist their draw. What a Cutie – thanks for sharing! Fun and exciting. I haven’t seen a baby gator in its natural habitat but I did see one in a tank at the Brazo’s Bend Park. I did see several mature ones at the same park particularly last Summer when drought hit Texas. Wonderful post. Thanks. I’m glad you enjoyed — thanks so much for your kind words! It’s great fun to see them in the wild (as with all babies), but it’s amazing what they must contend with, and their odds: Out of ~35 hatchlings, I saw 6-7 younger babies… Then a few weeks later, just this guy. Survival of the fittest, and all that.